Mackenzie had her follow-up appointment today at the office that made her brace. They were really pleased with how the brace was working. The guy that we have been seeing said he has never had a patient with that much correction in the brace, which is good news! He said that since Mackenzie is young, skinny and flexible, this helps the brace work better. We’ll see them again in 6 more months after she has her next x-rays. They’ll probably have to make a new brace then since she’ll be growing more. Hi my name is Gloria, form Charlotte, NC. My daughter, Nicole is 10 years old and just found she has scoliosis, her curve is at 44 degrees. She was prescribed the providence brace, but haven’t gotten it yet. We have an appoitment next thursday with the doctor to ask for other brace options, but i guess the night time brace is what she is going to need. Anyway I just wanted to say hi, and that i would like to know how Mackenzie is doing. Hi Gloria! The doctor we saw and the doctor/company who made her brace both said that the Providence brace has shown good results so far. When Mackenzie is in the brace she has almost no curve at all, so we’re just hoping the curve doesn’t get worse. We don’t go back for a follow-up x-ray for another 6 months. She does fine in the brace now – at first it made her pretty sore and uncomfortable but now it’s no big deal. Especially since she doesn’t have to wear it all day. Good luck and I hope your daughter has good results with whatever brace she gets! I would be interested to know how it goes with your daughter too, since I haven’t been able to find much information on kids who have worn the Providence brace with a curve near as bad as Mackenzie’s is (and around the same age as her). Hi, my name is Kat, and I discovered this blog when I did a Google search last night for “Providence brace.” My 9 yr old daughter is being fitted for hers today, and I was looking for more information and encouragement. I found that encouragement here! Thank you for posting about Mackenzie! I feel much more confident about the night bracing now. I personally went through day bracing (nearly 30 years ago, so it was quite a different experience than the bracing these days!) but I was older than my daughter by four years when I was braced. I was rather nervous about her being so young, but Mackenzie’s story has calmed those fears a bit. Especially the “skinny and flexible” part, as we’ve got that covered here ;). Again, thank you for being open with your family’s experience. I look forward to seeing Mackenzie’s improvement, and my own daughter’s as well. Would love to have some connections with other moms and daughters going through this, so if either you or Gloria would like to connect, please feel free to email me at kh (dot) findingangel (at) gmail (dot) com. Maybe the girls can write to each other or something. Hi Kat! I’m glad that my blog helped you feel more at ease about the whole Providence brace thing! 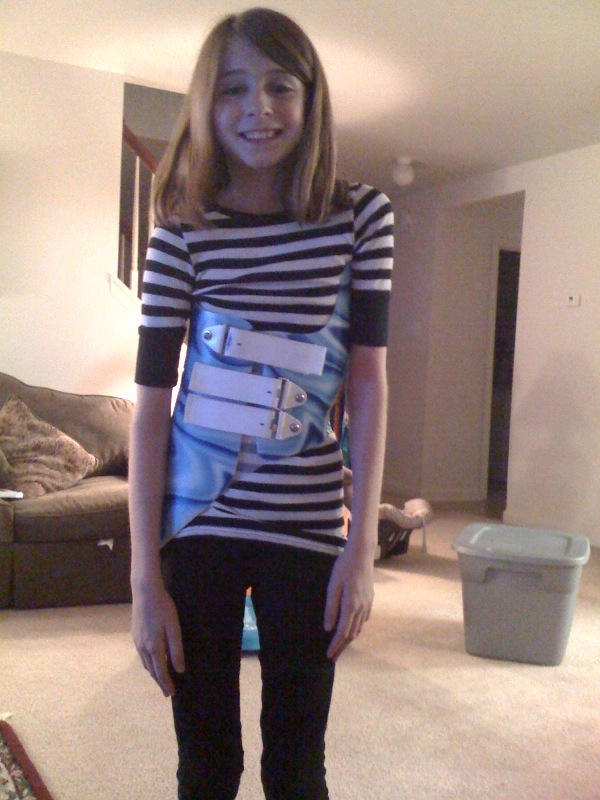 I had very mild scoliosis but never had to wear a brace so this was all new to us when we found out Mackenzie had it. They didn’t really expect much improvement since her curve was so bad to begin with but they were pleasantly surprised when she did show improvement. We just hope it keeps going that way. She doesn’t have another check-up x-ray until August. I’m glad you found us – it has been tough finding anyone with a similar experience with that brace. What degree is her curve at? I would be interested in how your daughter does also. I will email you sometime. Thanks for commenting! She’s got a double curve (S-curve), which is what I have as well. The top one is 21 degrees and the bottom one is 22 degrees. So when you look at her, you can’t really tell because they almost cancel each other out. And when I first noticed the curves they were even smaller, but I guess with my experience I had an eye for the signs. Her one hip was jutting out farther than the other, and I had her bend over and touch her toes. Then I noticed one side of her back stuck up higher. I panicked at first. She’s so much younger than I was! But the improvements in bracing have blown my mind and made me feel MUCH better about it. Anyway, her fitting went well, and we should have the brace by the second week of April. Then she gets an x-ray in it to see what the correction is. I do hope you email me. When I showed her the blog she was very excited about the idea of connecting with someone else who is going through this. We don’t know anyone personally at this point, and my experience was so long ago…I’m afraid it just won’t really hit home with her. Again, I’m so glad I came across this! Hope to hear from you soon :). Hi. My 13 year old daughter just found out yesterday she needs a brace. Either a Providence or Boston brace. The doctor left the choice up to her. He showed her a Providence brace and it freaked her out. She thinks it looks so uncomfortable she will be unable to sleep. To her the Boston brace – even with having to wear it 20 hours a day – looks more comfortable. I’m wondering how much trouble Mackenzie has had sleeping with the brace? I cannot imagine wearing a brace all day is better than only at night. And maybe my daughter will come around to realize that. But last night she was crying and very upset at the idea of the night-time only brace. Not only does she think it looks uncomfortable but she feels that she will be very isolated dealing with this as it only is worn when she’s alone and in bed. we have a little more time before we have to decide. it’s hard. I know what you mean – it is tough. They didn’t give her a choice on the type of brace; her doctor just said since she is on the skinny side that this brace would work better and he has had more success with it. The first week was tough but after that she adjusted nicely to it. At her last appointment in August they added some padding to it to make the brace more aggressive…and she has complained about it being tight, but that’s just what it has to do to work. I’m not sure what the other brace even looks like but I would choose a night brace over an all day brace. School kids can be mean and she was glad she didn’t have to wear a brace during the day. She has worn the providence brace for over a year now and other than her normal complaints of just not wanting to wear it, she has done well with it. I hope your daughter does well with whichever one she chooses! One thing that Phoebe is wondering is if she can lay on the couch and watch tv with the brace on? She barely sleeps 8 hours per night and is worried that she is supposed to wear it 8-10 hours each night. She is worried that she will feel imprisoned in bed with it on. Can you sit in it? Use the bathroom with it on? Or is it just laying down that it works? Her curve is in the mid 20s. The worst one. She has an S shape curve. Kate, that is the same as my daughters, round-about. She’s a double-curve, both at about 22*. Her doc told her that she can wear it while watching TV at night to get extra hours. The brace is designed for lying down, and it’s not like it won’t work at all while she’s sitting up, but I’d probably recommend she lie down in it just to make sure it’s fitting 100%. As for sleeping, I recommend buying snug-fitting pajamas and wear the brace over them. That is what I do with my daughter. Actually, she’s sleeping in leotards–nice and stretchy and comfy and they don’t bunch up under the brace at all. When it’s cold, she adds leggings to that. If she has to use the bathroom. she takes the brace off and puts it back on when she’s done. I can speak from experience, as someone who wore a brace as a teen–it feels odd, but you get used to it. And mine was nothing like these lightweight things they get to wear now! Mine had metal bars! I had to wear mine all day, too, and I’ll tell you what–if I could have had the kind of brace they make now, and especially if I could have worn one just at night, my middle school years would have been a whole different story! I know your daughter is scared, and the Providence brace looks weirder than the Boston, but she will be sleeping in a brace no matter which one she chooses. I’d go with Providence if she has a choice. She’ll be glad of it when she gets up every morning and can forget about it for all those hours. Kat – I can’t thank you enough for this information – – it is so helpful! I do have another question – of course. Can she lie on her side in the providence? or just on her back? I think she will be happier in the providence vs. the boston but I really need to calm down her fears about it. I remember those old braces though. And the Boston is so much better than what kids had to wear in the past. So even if she does make that choice, most of the time she can make it not noticeable. I just cannot imagine getting 14 hours off vs. 4 hours. Seems like an easy decision. But she just doesn’t want to deal with this alone – which is how she feels it is if it is only at night & only alone in bed. We will see. Hi Kate, my daughter wears hers lying on her side, back, and even stomach! She can only lay on one side because one side of the brace goes down lower to almost her hip bone and its more comfortable on one side vs the other. On your first comment, Mackenzie only puts hers on when she gets in the bed, so she doesn’t really sit up in it (kind of tough to do), but just like Kat said she will take it off if she has to go to the bathroom. Hopefully some of this has eased your daughters fears! Kate, she can roll all over in the brace. My daughter flips around all night. There’s no way for her to *not* move around in it if she’s asleep–her body will take over and she’ll move during the night as she normally does. It’s just that the brace is designed for their body being outstretched the way it is when lying down. And I know she may feel like she’s dealing with it alone, but make sure she realizes that she’s going to be lying in bed alone regardless of which brace she chooses. And no one is going to be wearing it *with* her during the day either. I had to wear my brace 22 hours a day for the first year. Then the second year I could go to school without it, but had to wear it all the time otherwise. The third year I got to just sleep in it. That was back in the early 80s, btw. If I had the choice to sleep only in a brace, I would have JUMPED on it. Even if it meant wearing it for more years, I think. Granted, the Boston brace now is a far cry from the Boston brace I wore, but will her choosing that one shorten her “sentence”? Will she be in and out of the brace sooner? Probably not. I can’t imagine choosing to wear the brace all day if I had the opportunity to wear it only at night. I would maybe suggest promising to sit in her room with her for a while at night. I know she’s older than my daughter, but that has really helped. I read to her every night, and it helps her fall asleep. There were some tears those first nights, from both of us, but it’s gotten much smoother now. Let me know how the brace works for you. What degree is her curve? The new comments to this just popped up in my inbox…Coincidence that my daughter just had her 6-month follow-up and I was thinking I ought to email you? The night brace is working great! She’s been very good about wearing it. The doc said the curves are holding well. He had her sleep without it the night before her appointment and the x-rays showed the curves as slightly smaller than when we started (which as about 22 degrees each). In the brace, one is pushed to almost 0 degrees and the other is actually over-corrected. We’re so happy right now! She has to go back again in 6 months. Oh, wow. I know you were hoping to avoid surgery altogether. Hopefully the brace will hold it enough that the surgery can be put off and won’t be so severe. I know how frustrated she must feel. I remember getting so tired of mine when I was her age. Let her know we’re cheering her on! Again – -thanks so much for all the information. Phoebe has now decided to go with the Providence brace – much in part to the great info from you. She goes in Thursday to meet the Orthotist & then it takes about 2 weeks til the brace is delivered. I don’t know if this helps, but someone I know in their 40s had surgery when they were young for scoliosis and really has no problems now. So hopefully if Mackenzie has to go that route, she will have the same outcome. Better yet, if it doesn’t come to that! That’s great – I’m sure she won’t regret choosing the Providence brace. Hopefully she adjusts to it quickly! And thanks for the encouragement about the surgery – if Mackenzie does have it, hopefully it will help her out in the long run. I actually have the same brace, design and everything. My scoliosis is 31 degrees top over 31 degrees bottom.Even though they cancel each other out, I lean towards my left all the time. Im 13 years old if you were wondering. My doctor said the same thing about me too how it should work great because I’m thin and flexible. I hate the brace. I haven’t wore it for more then a month and I already broke it. I cracked one piece of hard plastic that spins so the straps velcrow tighter and together. So then I had to get another new providence brace. How did Mackenzie get used to sleeping in it? I have to sleep in it for 10 hours and I been sleeping in it for maybe 6 instead? Then I get angry at it because I can’t fall asleep, rip it off, and throw it somewhere across my room. Then I find myself almost sleeping (especially pre-algerbra class) in school because I can’t sleep during the night. I swear I only get like 2 hours asleep each night. I’m getting used to it I guess before I would just hide it in my closet. Did mackenzie get used to the brace fast? Hi Morgan! Mackenzie is now 11 and has had her brace for 1 1/2 years. She doesn’t like it either but she did get used to it after a while. Now she is back to not really wanting to wear it – she’ll take it off after I go to bed or wake up in the middle of the night or complain that her stomach hurts while wearing it. I try to explain to her that she needs to wear it because if not, her curve may get worse and may require surgery. At her last appointment the curve was 49 degrees and she goes back in February to see if it has gotten worse or stayed the same. She has problems getting to sleep too and I’m sure the brace made that worse, but most of the time she does okay with it. Just try to think that it will help you in the long run and the more you wear it now while you’re growing, hopefully the faster your curves will get corrected. Good luck!